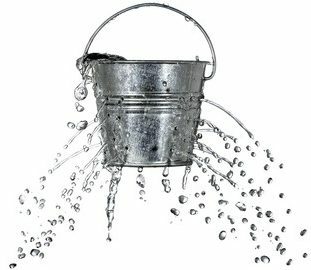 Trying to fill a bucket that leaked as quickly as you could pour water into it would be a frustrating way to spend your day—or your career. That’s how many fundraising professionals feel when all the gains they make in donor acquisition are lost in the next year to donor attrition. In 2006 the Association of Fundraising Professionals (AFP) launched the Fundraising Effectiveness Project (FEP) to conduct research each year on fundraising effectiveness. The AFP-FEP 2016 annual report is based on responses from 9,922 U.S. nonprofits that raised a combined total of $8.625 billion in 2015. The FEP survey also contains the latest data on donor retention and attrition. Below is a summary of the results as well as a few of my own comments about strategy and the true impact of an increased donor retention rate. 1. Only 46% of the donors who contributed at least once in 2014, contributed again in 2015 (i.e. a 54% donor attrition rate). 2. That 46% donor retention rate in 2015 represents a steady decline from a 50% retention rate in 2008. 3. The retention rate for new (first time) donors was under 23% and like the overall donor retention rate, has been steadily declining from 29% in 2008. The average retention rate for new donors giving $100 or less in 2014 was a measly 17%. 4. As you might expect, the retention rate among repeat organizational donors is much better—60% in 2015. However, looking at it from another perspective, losing 40% of the repeat donors (often the best donors) every year is rather frightening for any organization. 5. For nonprofits with annual revenues of $5 million or more, the average value of a 1% increase in the donor retention rate for a given year would result in $186,873 additional income in the following year (and more for significantly larger organizations). 1. Struggling Against the Impact of Negative Compounding. The potential impact of a 1% increase in donor retention should be enough to cause nonprofit leaders to begin refocusing their efforts. However, the $186,873 (see FEP stats above) is only a fraction of true value of a 1% donor retention rate increase because it only calculates the impact on the following year. It does NOT take into account the Lifetime Value of a Donor—that is, the cumulative impact of a retained donor’s giving throughout future years. The long-term impact of your donor retention rate is far more significant than the rate of new donor acquisitions. Additionally, if an organization’s renewed focus on donor retention rate meant that it simply maintained that 1% increase throughout succeeding years as well, the compounding factor of that one additional percentage point would make an enormous difference. And that’s without any consideration of bequests and planned gifts from a first-time donor who becomes a long-term donor to the organization. That same compounding effect can work either for or against your organization. Think about this: The FEP report revealed that both the repeat donor retention rate and the new donor retention rate was a negative 1% in each of the last eight years. Considering the financial impact of that negative 1% per year change in the donor retention rate, the compounding curve is working against many nonprofits. And the impact is equally significant. That same compounding effect can work either for or against your organization. 2. Leadership Decisions that Compound the Problem. As strange as it may sound, many organizations are dealing with the impact of a low donor retention rate by either reducing development staff or redoubling their efforts on new donor acquisition. There’s an obvious correlation between the declining donor retention rate and declining development staff per major donor (i.e. gift officers responsible for increasing numbers of major donors). “Two to three,” chief executive proudly reported. As the discussion continued I discovered that the major gift officer was indeed very busy, but that 85% of her time was devoted to acquiring new donors or (because of staff reductions) involvement with tasks unrelated to fundraising. What I meant to say was that though I live five minutes from that university, no one in the last 37 years has ever sat down with me to ask for money, let alone tried to build a relationship. The obvious benefit of direct mail and social media is that a small team of technical people can push the organization message out to millions of new, existing, and potential donors. They can even segment and tailor the message to match the profile of each recipient. However, the downside of a fund development strategy that emphasizes “pushing out” information is that there’s no interaction and, therefore, no developing relationships. Major donors are not necessarily craving more organizational news, more programs updates, or more solicitations. In fact, many are unsubscribing and requesting to be taken off mailing lists simply because of the flood of incoming mail and messages. What many are looking for is a not more information but more genuine appreciation—a sense of personal acknowledgment for their contributions. JUMP TO: Tug-of-war with a hand-delivered receipt. The downside of a fund development strategy that emphasizes “pushing out” information is that there’s no interaction and, therefore, no developing relationships. Last month I used the Zappos call center as an example of extreme customer service that results in extreme customer retention. Positive interactions with their customer-service reps create hordes of new customers simply by referral. Consequently, Zappos customers are fanatically loyal, and the company spends almost no money on new customer acquisition. See Culture of Philanthropy. Same dynamic applies to donor relationships and donor retention. There seems to be a negative correlation between the increased nonprofits’ reliance on social media and the donor retention rate, especially among first time donors contributing less than $100 (17% in 2015)—typical of contributions through social media platforms. A correlation doesn’t necessary mean that one thing causes the other, but my suspicion that the more nonprofits rely on social media and direct mail to push organizational information to current and potential donors, the shallower and less enduring the relationships—thus the declining donor retention rates. I understand the need for a dynamic social media presence on the internet. However, very rarely does it result in meaningful interactions and deepen donors’ relationships with the organization. 4. Aiming for Average. The overall donor retention rate reported in the 2016 FEP survey is an average. The majority of the participating organizations reported retention rates from 30% to 60%. Fundraising professionals don’t read books, attend seminars, or hire consultants to educate themselves on the “average practices” of mediocre organizations. They’re looking for the “best practices” of the highly successful nonprofits. Many of the nonprofits with average donor development effectiveness are struggling to keep up. At the same time, the executive teams are looking to aggressively expand services. Fundraising professionals don’t read books, attend seminars, or hire consultants to educate themselves on the “average practices” of mediocre organizations. In 2013 over 950,000 organizations were registered as public charities, a whopping 20% increase from 2003. The competition for donors is really heating up and organizations cannot afford to aim for average. 5. Organizational Performance Metrics and Donor Retention Rates. As I have said many times before, what you measure and monitor tends to improve. Unfortunately, performance metrics often reward increased donations and new donor acquisition but rarely the more significant impact of simply keeping the donors who are already supporting you. The first step forward in an effort to increase your organization’s donor retention rate is reprioritizing your donor-relations strategy. If your organization is not currently tracking the cost and effectiveness of donor retention, that would be the second step. Thank you for this post. We have been working on donor retention for years knowing some of the important things you pointed out, especially lifetime donor value. It is an ongoing big challenge! You pointing out the impact of a 1% increase is encouraging. We don’t typically look at small increases like that as very beneficial. That helps my perspective. For far too long we as an industry have been shooting for the “average” whatever when the average is way too low to begin with. Thank you for the encouragement to set our sights much higher.